We visit the much talked about Lancashire quarry! 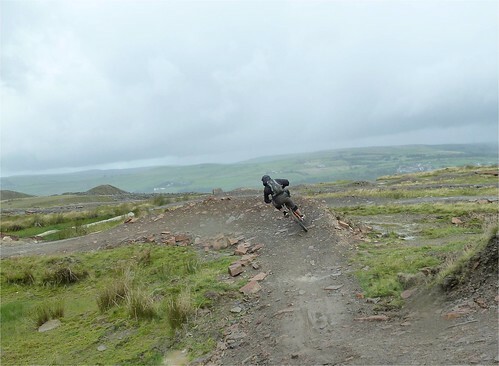 After months of reading about this Quarry in Lancashire, I had been eagerly awaiting the chance to go north and sample some of the riding. It looks like we just chose the wrong weekend for it! I always get quite excited about riding a new trail and never mind a few hours in the car if the riding is varied and good going. When we set off we knew that the trail at Lee Quarry was short so we had expectations that a few laps would be in order to make the most of the trip. On arrival there’s plenty of space to park up at the back of Futures Park, just be careful not to block the residential access! You then set off on a steady climb up into the quarry. Unfortunately for us, Last weekend was a bit of a stinker in terms of the weather, and no sooner had we set off the heavens opened. For the rest of the ride we experienced patchy showers and strong wind. Up in the quarry it is very open and there is little shelter from the elements once you hit the trail. This made it quite hairy on the return leg of the trail as the final sections are very exposed. This didn’t go down well and we never made a second lap. Conditions aside, the trail is very well built with some big features. On a good day you could session the entire trail or just particular sections, which I would recommend, as it is very difficult to nail each of the sections on the first pass. It reminds me a little of Brechfa in that respect, which is no surprise as Rowan Sorrell had a hand in the design. One of our main gripes about the trail is that it’s very hard to work out where you are supposed to go. We actually missed the first slab climb due to poor signage and only found it by chance just before we left, which was lucky because it’s a great section and would have been a crying shame not to have ridden it. The top of the trail is also confusing. With two red runs and a black run that all lead back to the same point, it is very easy to completely miss the actual third red run which takes you around the final half of the trail. This really bugged us as it left us completely bewildered after taking all of the wrong runs and getting nowhere. Maybe if the weather had been better we may have paid a little more attention to what was going on? The other issue is the black run. It just isn’t! I’m not sure how it got its grading? Slightly bigger, tighter berms? There is a better black run but it’s hidden away. After noticing a piece of trail that looked good we had a hunt around and found the start of the run on top of a mound. With no signage nearby, this again is a gem that is easily missed! It left us wondering what else we may have missed. All of that aside the place is well built and the different runs from the top make this a great place to go and have a bit of fun and hone your skills. With big berms, a drop off section, a massive slab roll and various skinny’s and logs, there is more than enough to keep you amused on a good day. A lot of effort has gone it to creating the most out of the space available, and it has really paid off in terms the potential to improve your riding skills. If you are expecting a nice long ride though, look elsewhere. The trail will leave you wanting; You are only just warmed up before it’s over. You are probably better off combining this with a trip to Gisburn Forest if you are travelling a long way and want to ride a decent distance. There is also a link being built that will link together Lee Quarry and Cragg Quarry. This will provide a much better distance and make it far more worthy of a trip. I’ll definitely be returning to ride both quarries once the link is in place. In conclusion, I wish that this place was right next door to my house. That way I could ride it whenever I want to and really make the most of it. A single visit on anything other than a nice and sunny/still day will result a lot of missed opportunity. This place really feels like a ’work in progress’, the potential is there, it just needs tidying up in order to bring it together. For me, if I’m making a special effort to go and ride somewhere, I don’t want to be left baffled, I just want to get on with it, so wasting good riding time trying to work out where to go when you are stood in the middle of multiple runs just isn’t making the most. Idiot proof signage would definitely improve the experience somewhat. Until the link goes in and extends the overall trail, Lee Quarry is not a trail centre and it should not be continually described as one. In reality it’s a place to go and ride some lines, a big skills park that is definitely a Mecca for the more northern rider who can nip out for a quick blast... you lucky lot! Pretty much agree with your comments, signing is poor, but then so was Gisburn so room for improvement, we also missed the main black at first and the map is a bit difficult to make sense off IMO. 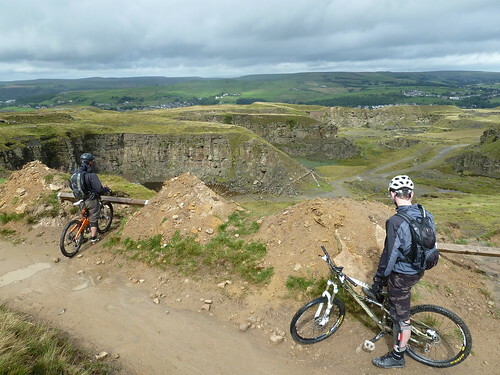 Definately get back up and do Cragg Quarry, very short but fast flowing and dare I say it more fun than Lee, but both together are a good day out. I pretty much agree with all your findings. Its an ace place when its dry and you have some play time but its a pain to ride when its cold wet and windy. the signage is a bit rubbish and even after multiple visits i was still finding new stuff! Its more the nature of the riding. In the Peak District you will naturally keep moving on the route with the end goal being the end of the route. With Lee Quarry its about having a play around and poor weather doesn't encourage you to keep going back up to the top for another run. Places like Chicksands are more covered, the woodland providing some shelter from the elements. That's what is missing here. Its not a major issue, it would just be far more fun on a dry day allowing you to make the most out of whats on offer. I'm sure you could find a little cafe in Bacup to satisfy you sports stodge needs! I wouldn't mind visiting the quarries but there is no way I could drive it in one day from London. It may be an excuse for a weekend away though, a chance to have a look at Gisburn or some of these routes in the Peak District that everyone keeps banging on about! So what you're saying then, is no where to get a bacon sports butty after the ride? Why does the weather would make that much of a difference? In the main, the Peak District is very open and exposed to the elements, but if you only rode that on a nice day, you'd never ride it?